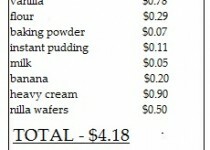 my mom use to make banana pudding all the time. she still makes it for me today! this was my play on one of my favorite desserts. this dessert, however, is not a cupcake that will last long. since you are not piping frosting on top, but using whip cream, these cupcakes should not be made in advance. i hope you enjoy them as much as we do! preheat oven to 350 degrees. line a 12-count muffin pan with cupcake liners. in a mixing bowl using an electric blender, mix together the butter and sugar until light and fluffy. mix in the eggs one at a time, then add the vanilla. in a small bowl add in the flour, baking powder and salt. mix in half of dry ingredients to the wet, mix in the milk, and then mix in the remaining dry ingredients, mixing until just combined. spoon the batter into the prepared muffin liners. makes 12 cupcakes. bake in the preheated oven, about 15 - 20 minutes. please do not over bake the cupcakes. remove from oven and allow to cool. in a small bowl, combine the pudding mix and milk, blending until thick, about 2 minutes. let the pudding mixture set for about 5 minutes to thicken further. then fold in chopped bananas. in a chilled bowl, add the heavy cream. mix with a mixer or whisk until soft peaks form. add in the sugar and vanilla. continue mixing until stiff. using an apple corer or a spoon, plug out some of the middle of the cupcake. spoon the banana pudding mixture into the cupcakes. 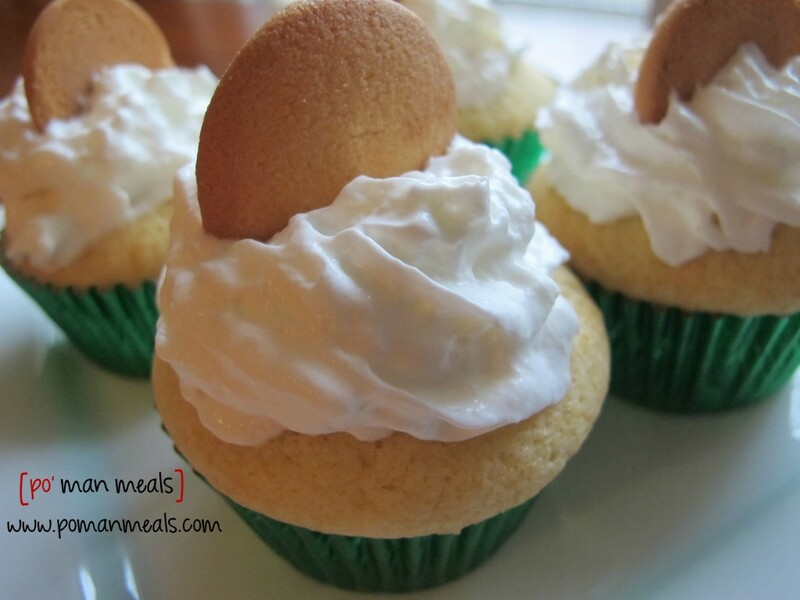 pipe some of the homemade whip cream decoratively over the top of the cupcakes and garnish with a nilla wafer.